GOG.com Are Going To Support Linux, Confirmed! This is fantastic news, GOG.com are finally going to open up their store to penguin lovers of the Linux family! 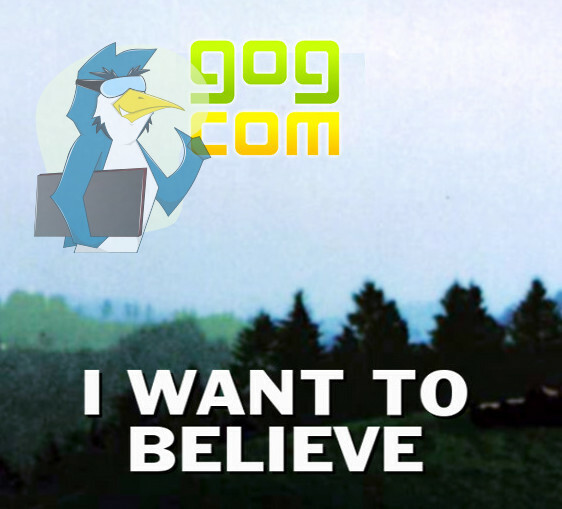 You may remember that I spoke to GOG.com in September of last year, where they explained they couldn't support Linux as it would be too challenging with their business model. I am happy to share with you that they will, finally be supporting Linux. Quote No, don't duck. This is actually good news. We just wanted to announce that, after much deliberation, we've decided that one of the next steps for us is to support Linux. Now, we're not ready to launch Linux games on GOG.com just yet. We've only been working on bringing these Linux games to our service for a few months, and there's lots more to go, but we wanted to let you know what's going to be coming this fall to a digital distributor near you. We're initially going to be launching our Linux support on GOG.com with the full GOG.com treatment for Ubuntu and Mint. That means that right now, we're hammering away at testing games on a variety of configurations, training up our teams on Linux-speak, and generally getting geared up for a big kick-off in the fall with at least 100 Linux games ready for you to play. This is, of course, going to include games that we sell which already have Linux clients, but we'll also be bringing Linux gamers a variety of classics that are, for the first time, officially supported and maintained by a storefront like ours. This is, as we mentioned, something that we're in the early stages of, so we can't talk about what games will be a part of our GOG.com on Linux gaming launch--in part because we, ourselves, don't know what those games are--but we hope that you're excited about the fact that we're able to set "GOG.com Support for Linux" in our community wishlist as a task that is "In Progress." We know we are! This means we will finally have a true DRM free store that really fights for DRM free, this is exactly what a lot of Linux users have wanted as GOG.com's stance aligns with a lot of Linux users thoughts. Not only that, but they will bring classic games over to our platform themselves and support them just like they do for Mac and Windows. This is exactly the way to win customers GOG.com and I applaud you. So, who else do we have to conquer now? Not many places I imagine. I admit, I'm surprised; I didn't expect that to happen any time soon (or at all). In fact, I'm still suspicious this is an early April Fools' joke. That is great news indeed! Linux support for DOSBOX powered games is definitely a no brainer and a trivial technical challenge. DOSBOX runs everywhere. For all the rest of the windows games... we hope but it's a big challenge to emulate them using wine with no issues. DrMcCoy I admit, I'm surprised; I didn't expect that to happen any time soon (or at all). In fact, I'm still suspicious this is an early April Fools' joke. Hahaha, I had the very same reaction and I checked the date to make sure this is still March. Seriously though I don't think they'll start porting games to Linux -and I really don't expect them to- but I'd be just as happy if they offered Linux builds of games that are already available on our OS. godlike That is great news indeed! Linux support for DOSBOX powered games is definitely a no brainer and a trivial technical challenge. DOSBOX runs everywhere. For all the rest of the windows games... we hope but it's a big challenge to emulate them using wine with no issues. If they really want to make wine wrappers they should probably ask the playonlinux guys. If they do use Wine, I'd want them to add that info to the game page (just like I want them to state when they use DOSBox and ScummVM).